to enrich your address files with geographic coordinates (x/y). Locating and projecting your addresses on a map (customers, prospects, establishments, real estate, etc.) begins with geocoding. 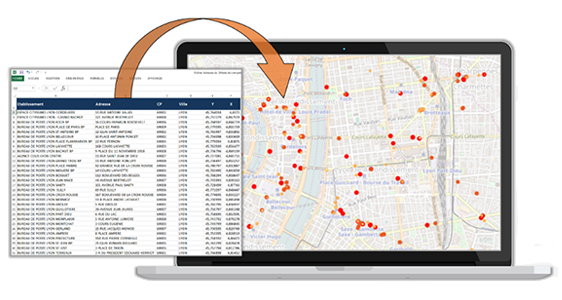 The Geocoding GeoService allows you to accurately geocode a large number of addresses. It also gives you the possibility to manually modify the incorrect addresses (by inputting them or by moving the marker directly on the map), to add the INSEE codes of the municipality (COG and IRIS for France) and to set up automatic geocoding scripts via an FTPS connection. The Geocoding GeoService now covers all world countries, with varying coverage rates depending on the geographic area. Performant : The Geocoding GeoService allows you to quickly and efficiently geocode files with a large number of addresses. Intuitive : The Geocoding GeoService is very easy to use and leads you step by step to import your address files to geocode. After the process, you can export your address files enriched with coordinates x / y. 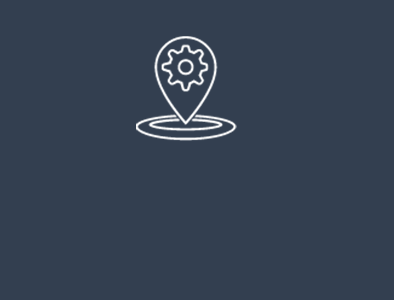 Easily automated : Geocoding also offers the possibility of setting up automatic geocoding scripts via an FTPS connection. Do you want to know more about Geocoding API? Step 1 : Connect to the geolocation platform. Step 2 : Import your addresses to geocode. Step 4 : Correct invalid or missing addresses by manually inputting them or by moving the marker directly on the map. Step 5 : Geocode your address files to the IRIS geographic level (only for France). Step 6 : Export your geocoded address file.